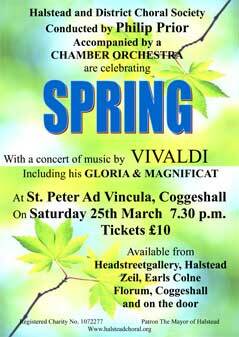 Halstead Choral’s Spring Concert, in St. Andrew’s Church, was tremendously impressive. Soprano soloist Sara Brimer Davey, radiated excellence, from Ave Maria via Weep You to her seemly effortless Hear My Prayer. In the brilliantly chosen Rutter’s Requiem, the choir’s antiphonal response to Sara produced an emotional performance that stunned the audience into pre-applause, pin-drop silence. Ubiquitous accompanist Nigel Brown, again on tremendous form and the charismatic conductor James Davey enabled the bass-light choir to smoothly navigate any challenges. Bravo!! 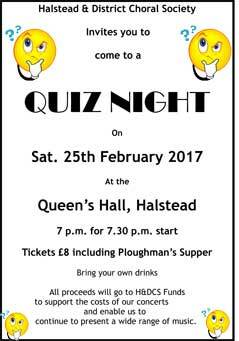 Musical Director James Davey presented a cracking cabaret concert, All Creatures Great & Small, for Halstead Choral Society. Duettists Margaret Hill and Liz Pottinger heralded the second half entertainment which brought the house down. Sue Bennett’s Memory was spot on and Ann Reed’s bluesy lady had a tramp in accompanist Nigel Brown. His seemingly untiring keyboard skills shone throughout the night. Meanwhile Margaret and Helen Marr’s cat duet rightly drew tremendous audience acclaim and James’ exuberant working of the latter with My Dog was another show-stealing number. A gorgeous Gibbon’s madrigal, a Nigel enhanced nightingale chorus and the glorious crescendo of Stanford’s Blue Bird, were also choral delights. 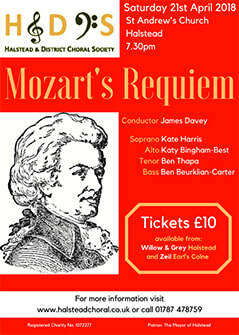 Halstead and District Choral Society’s rendition of Mozart’s Requiem in Halstead’s St. Andrew’s Church, fully justified the audience’s wow shout. The momentum achieved by Musical Director James Davey led to a memorable performance. The opening Kyrie set the standard that, with only one flag, turned local singers into musical powerhouses. Bass Ben Beurklian-Carter’s sustained opening Tuba thrilled, while never more aptly chosen, when Ben Thapa’s Rex Tremendae confirmed his tremendous Tenor/Baritone resonance. Also Katie Bingham-Best’s Handel Aria and gorgeous Soprano Kate Harris’ lead of Laudate Dominum proved that these outstanding professionals were not just there for the ride. I enjoyed, in their delightfully versatile hallmark style of programming, the 60th Anniversary Concert from members of Halstead and District Choral Society, which began by confirming the strength of their a cappella singing. The inclusion of Elgar’s bizarre jauntiness allowed experienced organist, Stephen King, to demonstrate his piano playing virtuosity. Vocal fun came courtesy of Captain Noah, Eddie Morley and his tenors. The strong second half featured what musical director, Philip Prior, referred to as English slush including The Long Day Closes with its effective Bass entries and controlled dynamics. Halstead and District Choral Society went on tour to a beautifully warm St Peter Ad Vincula, Coggeshall. Musical Director, Philip Prior, packed the choir and Chamber Orchestra and hidden soloists, on to the chancel steps of his home venue. The highlight of this Spring concert, Vivaldi's Gloria vindicated this cheek by jowl arrangement. What bliss to hear Soprano Beverly Lockyer and Alto Katie Bingham-Best, in duet with oboe and cello respectively.Philip's rollicking pace imbued the choir with joyful confidence, including their effective a cappella moment. Also sublime was Gill Gerrard and Victoria Richmond rendition of Vivaldi's Concerto For Two Oboes. Modest Christopher Moore delivered a delightful Organ Concerto too, one of his several roles in the evening. 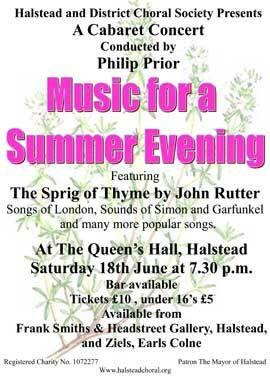 Music for a Summer Evening, was presented by Halstead and District Choral Society in the Queen’s Hall. It hit all the right notes with excellent acoustics, friendly atmosphere and a well planned programme. Individual members shone, from Margaret Hill’s stunning opener to Eddie Morley and Charles Martin’s differently pleasing vocal timbres. Tony Court brought the house down with his Floral Dance, Janet Webb relaxed into pop mode and Liz Vince and Alison Day showed duetting expertise. Musical Director Philip Prior conducted, sang, played and proved a most proficient song arranger. As for the rising star, accompanist Hector Preston, his musicality again soared. The tremendous audience participation in the Simon and Garfunkel finale exceeded expectations. Bravo! Another triumphant, in-house Concert from Halstead Choral Society. Musical Director Philip Prior was inspirational. Halstead and District Choral Society's concert of French music began with Poulunc's Gloria. The choir's fabulous dynamics and intonation, greatly aided by its positioning, plus soloist Beverley Lockyer's soaring clarity made this a memorable experience. In her French pieces she delightfully demonstrated her range. The accompaniment from organist par excellence James Davy added much lustre to the superbly programme Faure too. St Andrew's Church hosted some fine music making. Palm Sunday weekend provided a local musical feast that began with Halstead and District Choral Society, on tour in St. Andrew's Church, Earls Colne. 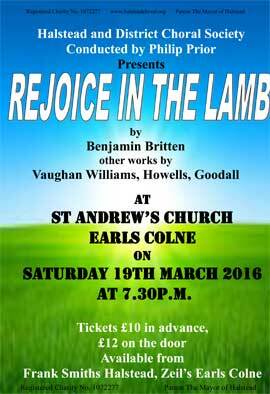 Their very accessible centre piece, with its delightful domestic imagery, was Britten's Rejoice in the Lamb. Controlled throughout by organist Peter Dollimore's delicate touch, it allowed Sue Bennett and Eddie Morley to step up from the choir most adequately. Although Musical Director Philip Prior set a challenging first half, his own solos showed a deep respect for the church's prestigious organ. Mighty, deep-throated Soprano soloist Beverley Lockyer lighten the Benedicte load, while the programmatic Sumsion and jolly Goodall, ensured that the appreciative audience left in a joyful mood. 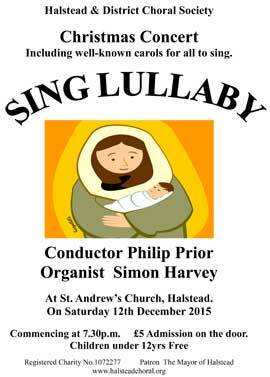 First to Halstead's St. Andrew's Church for Sing Lullaby. Halstead and District Choral Society preformed their Christmas concert with a relaxed gusto that did terrific justice to musical director Philip Prior's programme. There wasn't a carol that didn't work. Brian Firmin and I sang the Wilcock's descants in the audience participation ones, nostalgically recalling our days in the Ramsey School Staff Choir as we did so. Liz Pottinger and Margaret Hill's Blest Mary duet blended beautifully. Likewise, Elizabeth Vince, Alison Day, Eddie Morley and Philip did delightful justice to the latter's own composition Where Is The Room? Congratulations to Halstead and District Choral Society for its recent Handel programme in St. Andrew's Church, Halstead. Wisely, after a three hour rehearsal, Philip Prior, musical director, placed the four soloists among, rather than in front, of the choir. After the challenging, and less familiar first half, the rewards were heard in Zadok the Priest and the poignant 3rd movement and rousing 4th one of the Founding Hospital Anthem. Vocal exhaustion probably prevented a deserved encore of the latter. The scratch orchestra created a delightful antiphonal response to the organist Peter Dollimore. His superbly sensitive rendition of a Handel Organ Concerto was outstanding and his accompaniment rock solid throughout. 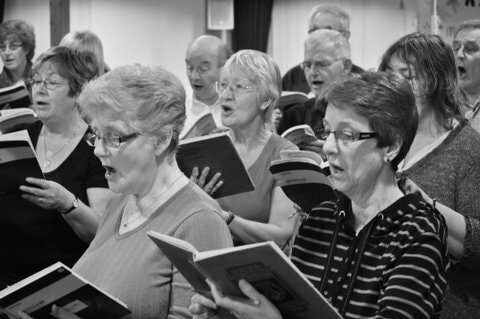 In Earls Colne village hall, Halstead and District Choral Society's Oliver!, arranged by their director Philip Prior, was a triumph. After a first half mixed bag, Eddie Morley's outstanding performances and Sue Bennett's dulcet tones and strong audience participation, showed the Society at its best. New Society accompanist Hector Preston added just the right touch to the delightful Who Will Buy? Ensemble. In fact, his superb keyboard contribution throughout, for me , negated the need for fancy staging and an imported band. Bravo to soloists, choir and especially Hector. 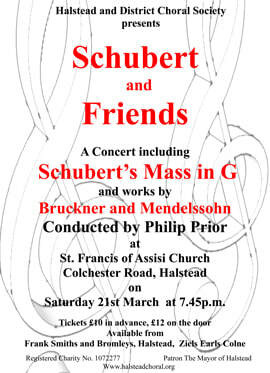 Halstead and District Choral Society, suitably for Lent, pleasingly presented Schubert’s Mass in G. Unsurprisingly musical director Philip Prior brought back some of the popular soloists. Tenor Andrew Johnson and bass Ben Beurklian-Carter, gave good value throughout. Soprano Beverley Lockyer stole the show again. She and the choir ensured that Hear My Prayer was the concert's highlight. 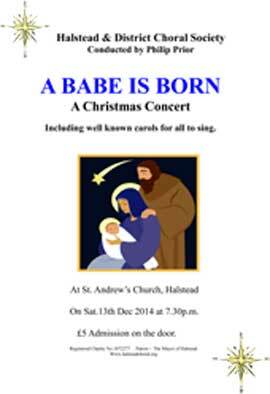 A Babe Is Born was presented by Halstead and District Choral Society in the acoustically splendid, but slightly chilly, St Andrew's Church. Whether singing unusual descants to familiar carols or providing small exquisite ensembles that featured, among others, Liz Pottinger, Margaret Hill and the Webb girls, Halstead Choral Society provided memorable in-house Christmas music. Conductor Philip Prior worked the audience well, while accompanist. Simon Harvey, excelled on the piano and organ. Perfect programming ensured the sustained end notes of Mathias contrasted beautifully with the following Rutter. Brian Firmin and I enthusiastically relived our Ramsey Staff Choir Days in Gaudete as the aroma of mulled wine pervaded the air. Well done and thank you Choral Society. 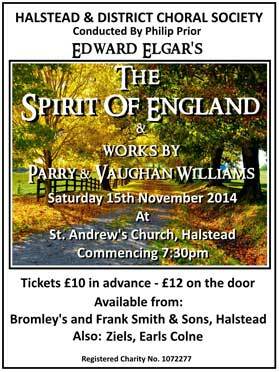 The Spirit of England, presented in St. Andrew's Church, was Halstead and District Choral Society's First World War commemorative concert.' Now in thy splendour go before us' was the opening line, and the music did. Conductor and musical director Philip Prior obtained a fulsome sound from his choir in the first half. When guest soprano Beverley Lockyer came in, it was marvellous to hear her powerful, effortlessly-reaching voice soar over its tumultuous swell, to create an outburst of emotion that needed no microphone assistance. Particularly impressive, as well as her range, was Lockyer's match of words and phrasing. She showed how to cope with Binyon's Victorian verbosity. Organist Stephen King was another inspirational visitor who greatly aided the delivery of Elgar's music. His sympathetic diminuendos and different stop embellishments added much to the dynamic role he played throughout, including his solo. It was an evening of two halves. After the interval, Vaughan Williams' jollity and Parry's Blest Pair of Sirens seemed less enjoyable than the more sombre works that preceded them. Halstead's mayor, David Hume, attired for the occasion in shining regalia, rightly praised the choral society for its contribution to civic life. It is at its cultural centre. 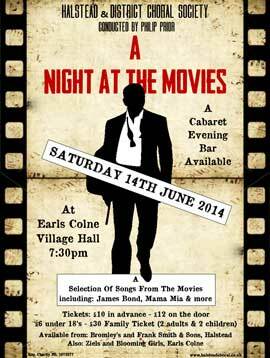 Hats off to the members of Halstead and District Choral Society, for creating a cabaret atmosphere in A Night at the Movies, in Earls Colne Village hall. Children in the packed audience were rewarded for their patience by the upbeat Mamma Mia and James Bond medleys. The latter featured musical director Philip Prior’s mock martini and in-tune reed players. Pianist Simon Harvey did splendid work from a difficult position. Among varied solos, from Liz Pottinger’s Autumn Days to Janet Webb’s Skyfall, one singer stood out. The pure pitch of Margaret’ Hill’s voice was the perfect match for Walking in the Air. A choir have bid a fond farewell to their musical director after he conducted his last concert. 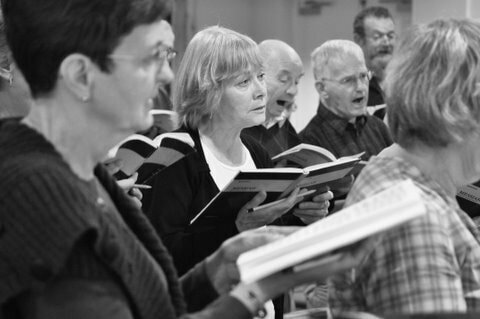 Ellis Bell has directed the Halstead Choral Society for the last four years, but is leaving due to work pressures. He conducted the choir for the last time in their annual Christmas performance. During his time with the choir, Mr Bell extended their repertoire and improved their performance. Sue Bennett, chairman of the society, said: " It has been a privilege to work with such a talented musician." 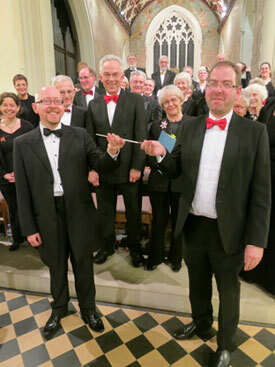 During the Christmas concert he passed his conducting baton onto Philip Prior, an organist and director of music at St Peter-ad-Vinacular in Coggeshall who will take over in the role of musical director. He will be leading the choir in Mozart's Requiem for their next concert in March. Report from the Halstead Gazette. The departing musical director of the Halstead and District Choral Society Ellis Bell, left a magnificent legacy, when he conducted Karl Jenkin's Armed man, in Halstead's St Andrew's Church. Choir and instrumentalists excelled in this mass for peace …….. From Sue Bennett's impeccable recitative to the choir's emotive battle cries, everything worked. I loved where Ellis placed the tenors, giving lustre at the centre. Dynamics shone, whether in the dramatic Introit and its effective reprise or the resolute tempo of the famous Sanctus. Trumpeter Martin Elms played the Last Post. Alex and Eleanor Beattie's bloody men drumbeats and Torches' clashing cymbals were galvanising. The fine piano and organ interplay between Daniel law and Victor Scott, respectively, was captivating. Britten's centenary was cleverly celebrated in the first half. Rachel Bell's glorious voice soared in the well-modulated Te Deum and Victor found some delightful organ stops in the Jubilato Deo. Elsewhere the choir did what I think it does best, some lovely tuneful a cappella and Margaret Hill was another one of the successful soloist. Very, very well done. Halstead Choral Society had its buoyant Last Night Of The Proms at St Francis of Assisi Church, dedicated to the much missed front of house manager David Marner. The Proms sparkled under the musical director Ellis Bell's merry baton, with Margaret Hill and Liz Pottinger as duetting Carmen. Tenors Eddie Morley and Dennis Hume performed a very pleasing West Side Story Medley that revealed a tuneful choir. Outstanding accompanist Christian White made the electric piano sing. Guests, Clacton-On-Sea Co-Operative Band, finally matched their dynamics to the acoustics, behind the choir, in the flag waving finale. The audience wanted more. Creation went with a bang. The sound of fireworks on Saturday night made a fitting introductory backdrop to Haydn's The Creation. In St Andrew's Church, Halstead and District Choral Society provided a marvellous display to match it. Musical director and conductor, Ellis Bell, really had got it all for this event. The soloists, on whom the success of this joyous oratorio triumphed. Soprano Emily Armour and tenor Sam Weatherstone never faltered. When they were joined by bass baritone Simon Dyer, their harmonic trios surely revealed Mozart's inspiration for his operatic ensembles. Simon is a young performer with huge potential. His vocal range and delivery, especially bleating, will stay long in the memory. Peter Ivey's orchestral ensemble gave strong support. It was particularly effective when mimicking the animals and birds. Finally, full marks to the chorus. It was up and down, often with some time to wait, but sing ye voices all they did. PIRATE PIANIST PLAYS PART TO PERFECTION. The concert version of Pirates of Penzance, presented by Halstead and District Choral Society last Saturday in St. Andrew's church, worked wonderfully. The necessary transformations of pirates into policemen and the musical director, Ellis Bell, thrusting himself among them as their sergeant, was the hilarious highpoint of this hugely successful entertainment. Peter Dollimore's magnificently reliable piano playing throughout encouraged some excellent home grown Society talent. Sue Bennett's superb Ruth set the standard from the start. She was matched by twinkling eyed Eddie Morley, in glorious voice as Frederic, who looked like the cat who'd got the cream in his duets with his powerfully voiced Mabel played by Rachael Bell. Bill Berks' Pirate King exuded confidence, and splendidly costumed David Kelly was a near perfect Major General. Margaret Hill, Liz Pottinger, John Nichols and the always attentive chorus completed a cast that looked as if it enjoyed performing as much as we loved watching them. More Gilbert and Sullivan please. HDCS did poignant justice to Stainer's Crucifixion in St. Andrew's Church last Saturday. It culminated with their musical director, Ellis Bell, as he held them after Crucify, which gave the final chorus superb dramatic resonance. Tenor soloist Paul Hazelgrove-Spurin had relaxed into his comfort zone while heavenly bass Ashley Mercer proved a star in the making. Chilcott's Requiem, which opened the concert, was notable for strong soprano Christine Cunnold, as well as Peter Dollimore making the most of the catchy piano theme. Pleasant though this item was, it was the wonderful Stainer that made it for me. 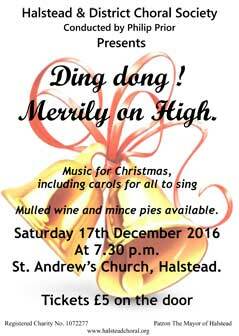 The choice on Saturday evening between 'Strictly' and this concert was not an easy one to make but those of us who chose Halstead Choral Society's carol concert were not disappointed and well rewarded. We were treated to an excellent and varied programme of Carols and Christmas songs conducted by Ellis Bell and accompanied by Peter Dollimore. Ellis kept the audience involved throughout by linking each piece with his witticism and banter. 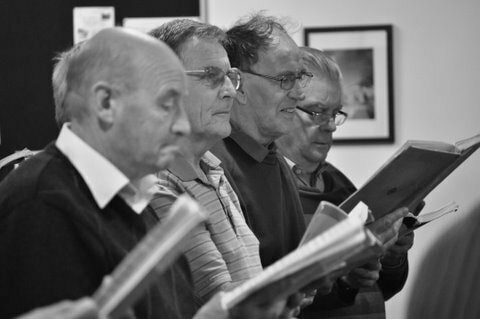 This was enjoyed not only by the audience but also members of the choir and helped to create a jolly atmosphere. We were able to enjoy a trio and duet by members of the choir which was very pleasing to hear. I must also make a special mention of the Michael Head song sung by Rachel Bell. Her voice is a pure 'bell like' sound that filled the our beautiful St Andrews Church wonderfully. It was good to see the return of Brian Firmin who presented readings in his own inimitable way. The piano solo played beautifully, as always, by Peter Dollimore was a joy to hear. I cannot forget the 'Psalm'. This was a 'psalm like' rendering of the instructions for the safe use of an electric blanket. We were not expecting that and to include it was genius. This choir goes from strength to strength under the direction of Ellis. Their tonal quality and attention to detail are to be commended. There were lots of smiles and enjoyment coming from the singers (and their conductor) which ensured that we all had a truly lovely start to our Christmas celebrations. Hallelujah to Halstead and District Choral Society for its presentation of the Messiah, in St. Andrews Church last Saturday. Warmth of greeting and venue, and well-sighted side aisles and staging, prepared the way for a glorious experience. Charismatic musical director Ellis Bell, made magic with his immacutely-attired choir. Strong entries abounded. From the resonance of the lower register in O Thou That Tellest to the harmonic success of Lift Up Your Heads and the admirable a cappella section of the Redeemer intro, there were many memorable moments. What a clever idea it was to place the soloists in the front pews, it made them so much a part of the whole experience. Lyrical tenor Paul Bloomfield's opening recitative set their standard. Soprano Gill Wilson's Redeemer triumphed, while Patrick McCarthy's crisp round baritone and Elaine Henson's alto voice never disappointed. Ensuring the vocal success was Peter Dollimore's tireless continuos playing, and Peter Ivey's exquisite sweet-playing leadership of his chamber ensemble. As for The Trumpet Shall Sound, this one did, magnificently. Halstead and District Choral Society scored a hit with the second half of their Summer Concert in St Andrew's Church last week. Both Rutter's English Folk Songs and Runswick's American ones confirmed the choir's a cappella strength, especially in Shenandoah. I loved John Nicholl's poignant cowboy and the harmonic undertone too. Tenor soloist Eddie Morley, as Chibiabos, got my bouquet of the evening for his response to the challenge of Hiawatha's Feast. Peter Dollimore's outstanding piano accompaniment, Ellis Bell's virile vocal direction, and the choir's mid-section lyricism also rescued this wordy work.